Horses For Courses is the report that is available to all registered users on a Friday, and it shows that Sound Advice has a decent record running at Chester. From nine races there, he's had four winners and places (44.44%), for level stakes profits of 25.00 and 26.45 respectively. He runs in a handicap over just under a mile in a race that has a wide open look to it. The recent form of Sound Advice has not been great, however, he last win was five runs ago in this race last year, and he runs from the same mark today. The ground was good to firm that day so any further drying of the ground would be a plus. Keith Dalgleish has a reasonable long-term record at this course. Over the past five years, he's had four winners (12.90%) and six places (31.88%) for an Impact Value of 1.10. He also has a good record with his horses coming back from a break of 60+ days. 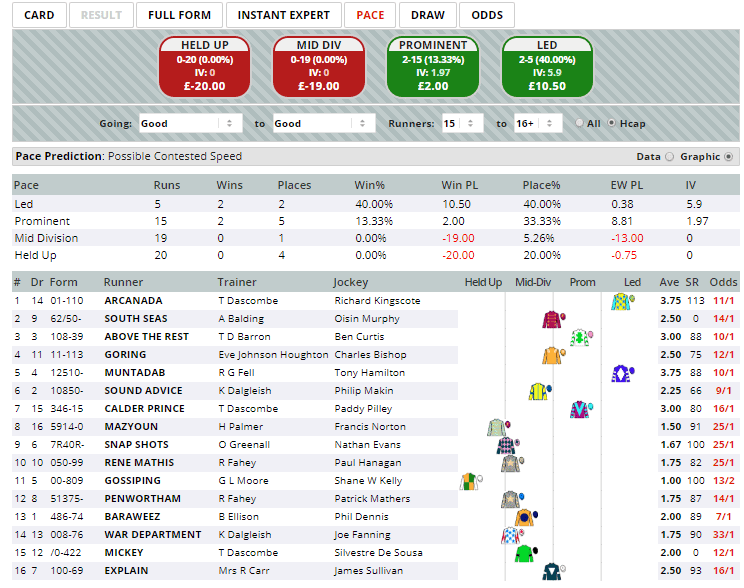 With these such runners, he is 35/229 (15.28%) for an Impact Value of 1.63. Jockey Phillip Maken has a good strike rate here at Chester. Over the past five years, he's had six winners (14.63%) for an Impact Value of 1.24. With the Instant Expert report looking at the past year for handicaps, Sound Advice comes out well with three sections of green. As mentioned earlier, he races from the same mark as his last victory, so with conditions in his favour I am hopeful of a good run at a nice price of around 9/1. The Pace report shows that Arcanada and Muntadab look the most likely to be fighting it out for the early lead as they are both usually quickly away and have favourable draws in stalls one and four, respectivrly. Sound Advice isn't usually the quickest away, but he is drawn in stall two so has a great chance to get a good early position. 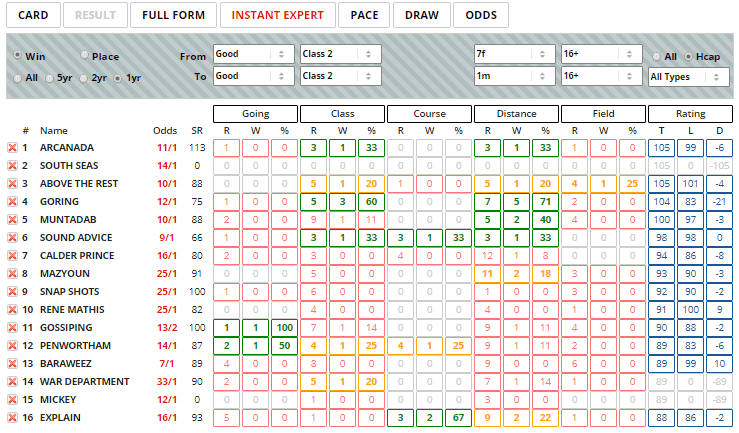 Click here for the 13:50 at Chester.